When poverty is viewed as a matter of degree in contrast to the conventional poor/non-poor dichotomy, that is, as a fuzzy state, two additional aspects are introduced into the analysis. The choice of membership functions i.e. quantitative specification of individuals’ or households’ degrees of poverty and deprivation. And the choice of rules for the manipulation of the resulting fuzzy sets, rules defining their complements, intersections, union and aggregation. Specifically, for longitudinal analysis of poverty using the fuzzy set approach, we need joint membership functions covering more than one time period, which have to be constructed on the basis of the series of cross-sectional membership functions over those time periods. 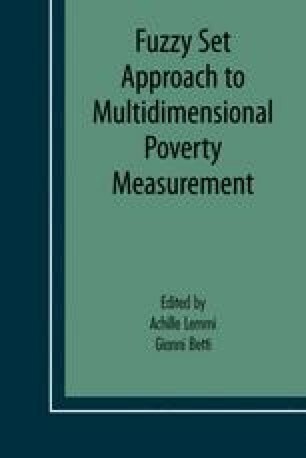 This Chapter has discussed approaches and procedures for constructing fuzzy measures of income poverty and of combining them with similarly constructed measures of non-monetary deprivation using the fuzzy set approach. In fact, the procedures for combining fuzzy measures in multiple dimensions at a given time are identical, in formal terms, to the procedures for combining fuzzy cross-sectional measures over multiple time periods. We have proposed a general rule for the construction of fuzzy set intersections, that is, for the construction of a longitudinal poverty measure from a sequence of cross-sectional measures under fuzzy conceptualization. This general rule is meant to be applicable to any sequence of “poor” and “non-poor” sets, and it satisfies all the marginal constraints. On the basis of the results obtained, various fuzzy poverty measures over time can be constructed as consistent generalizations of the corresponding conventional (dichotomous) measures. Numerical results of these procedures applied to measures of multidimensional poverty and deprivation, and to combinations of such measures have been presented elsewhere.